Normally, when you think of batter-runner interference, you think of the batter-runner who runs out of the 45-foot long, 3-foot wide runner’s box the last 45-feet and interferes with the fielder taking the throw. But batter-runner interference can occur long before the batter-runner reaches the box. Once the ball is batted into fair territory, any interference with the ball whether it is touched by the batter after leaving the box or, whether his bat hits the ball a second time, would both be considered violations (interference) by the batter-runner. Let’s look at a couple of recent plays. I covered this in Report No. 43 but thought I would revisit it for the sake of repetition and learning with a clear video clip that should create awareness among your players, if they view it. The Twins hosted the Rangers on Aug. 5. 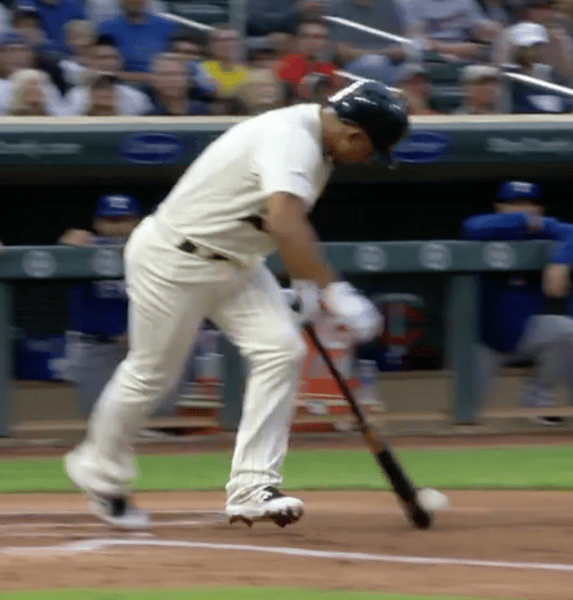 In the bottom of the first, Eduardo Escobar was batting with a runner on first and one out when he hit a tapper in front of home plate. Because his bat initiated contact with the ball in fair territory, he was called out by plate umpire Mark Wegner. You can view the play by going to the link below. The following play includes a batter-runner interference call that, in my opinion, was incorrectly made. It is interference by a batter if his fair ball touches him before touching a fielder unless he is in a legal position in the batter’s box [5.09 (a) (7)]. The Pirates and Padres played at PNC on Aug. 6. when the Padres’ Wil Myers was called out by plate umpire Tripp Gibson for batter-runner interference. From this corner, it appeared that Myers was still in the batter’s box when the ball came up and made contact with him.